U.S. astronaut Jose M. Hernandez, a Mexican American, said one of the most memorable experiences during his recent trip to space was being able to look at Earth and marvel at a world without borders. After the two-week mission ended earlier this month, Hernandez told Mexico’s Televisa network that the U.S. should legalize the millions of undocumented immigrants living and working in the country. Advocating for comprehensive immigration reform, Hernandez said immigrants are an important boost to the U.S. economy. Following Hernandez’s remarks NASA officials “flipped” and went “ballistic” according to the Los Angeles Times. NASA spokesmen said the views expressed by Hernandez were his personal opinions and don’t represent NASA, the astronaut office or any NASA organization. In response to NASA, Hernandez made it clear he was standing by what he said. Hernandez, 47, a California-born son of Mexican immigrants, grew up picking cucumbers, sugar beets and tomatoes in the fields of the San Joaquin Valley. His first language was Spanish and he didn’t learn English until age 12. His parents migrated from Mexico to Northern California in the 1950s in search of work and a better life for their four children, including Jose, the youngest. Hernandez recalls living the typical life of a migrant worker, moving constantly with his family following the crops. His parents eventually settled near Stockton, Calif., to give their children a better education and a more stable life. They eventually became U.S. citizens. 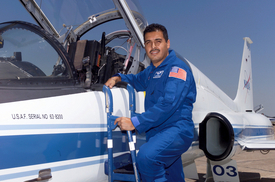 As a student Hernandez excelled in math and dreamed of one day becoming an astronaut. He admired and watched the Apollo spacewalks on television. After earning bachelor’s and master’s degrees in engineering, Hernandez applied for the space program every year for 12 years straight. He was finally chosen in 2004. While in space during a 5.7-million-mile mission to the international space station aboard the shuttle Discovery, Hernandez became the first astronaut to tweet bilingually in Spanish and English with his Twitter moniker Astro_Jose. He also hosted live interviews on local TV programs in Mexico while in orbit. During the mission Hernandez gave a salsa dance lesson, discussed Mexico’s World Cup aspirations and led a mini-science lesson for his viewers. He also made taquitos and burritos for his fellow spacemen and fielded questions from YouTube users. In a period where opportunities for Mexicans are scarce and jobs there are hard to come by, deportations of immigrants in the U.S. are at record levels. Tightened border security and the economic climate in the U.S. have caused a historic drop in the number of migrants heading north. Many say the American dream for Mexicans and their families is slowly fading. Yet millions of Mexicans followed Hernandez’s every move with mission updates on national television and on Twitter. They see his accomplishments and his success story as an example of what hardworking Latinos can achieve despite all the obstacles and challenges. Hernandez, a father of five, said a good education with parents who forced him to study, who checked his homework and stayed involved in his schooling were instrumental for him growing up. “What I always say to Mexican parents, Latino parents, is that we shouldn’t spend so much time going out with friends drinking beer and watching telenovelas, and we should spend more time with our families and our kids … challenging our kids to pursue dreams that may seem unreachable,” said Hernandez. Hernandez was one of two Mexican-Americans aboard the space shuttle, marking the first time two Latinos have flown in space together. Astronaut Danny Olivas was making his second space flight. Rodolfo Neri Vela, a scientist, was the first Mexican citizen to make it to space, flying aboard the shuttle Atlantis in 1985.